While his nickname – the Cat – indicates his goalkeeping background – Bob is a top corporate comedian tailoring his act to the characters in the audience. He has appeared in Australia and the USA on a number of occasions as well as Hong Kong, Kenya and South Africa. After a Variety Club Luncheon with Sven Goran Eriksson, Henry Winter in the Daily Telegraph awarded him the Best After Dinner Joke of the Year. “Comedian Bob ‘The Cat’ Bevan informing Park Lane audience, including Sven Goran Eriksson, that he could not stay long because I’ve left the dog with the neighbours – and they’re Korean”. He has made countless TV and radio appearances. He followed Danny Baker as presenter of BBC Radio 5’s Six-O-Six Show. He has also appeared as a stand-up comic in the BBC 1 Variety Show – Jim Davidson Presents and Auntie’s Bloomers with Terry Wogan for the fourth time. In January he was the subject of a documentary on Meridian TV on which channel he has also had his own show. 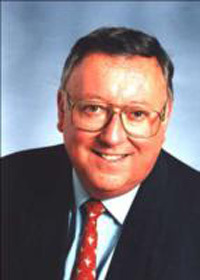 He has appeared frequently on Sky TV, including as a spoof cricket reporter and on a Christmas panel of four comedians. There aren’t many people in the business he hasn’t worked with. He was asked to appear in “Ronnie and Friends” at the Fairfield Halls with Ronnie Corbett, Jasper Carrott, Jimmy Tarbuck and Bruce Forsyth. The list also includes The Bee Gees, Elkie Brooks, Eric Clapton, Phil Collins, Billy Connolly, David Essex, George Harrison, Bob Hoskins, Barry Humphries, Elton John, Elaine Paige and Rod Stewart. In April 2001 he appeared in front of 5,000 people at The Royal Albert Hall at a Tribute Bands Concert. He has also appeared with several members of the Royal Family and alongside the late Archbishop of Canterbury, Lord Runcie, one of the many public figures he has written for. Bob was awarded the MBE in the Queen’s Birthday Honours List in 2004 for his charitable services.